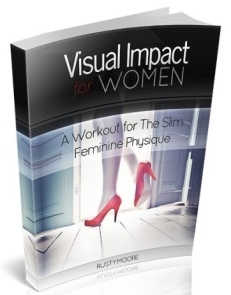 Back in January I launched a Beta release (just to my newsletter) of a muscle building course I created called “Visual Impact”. I did my best to keep it low key and didn’t post it on my blog or anything like that. My goal was to expose this course to a small group and get their feedback and then make an improved version and then create the final product. I sent out a survey a couple of months after this Beta release and to my delight, almost everyone who bought it was still following the program and getting solid results. This is practically unheard of when it comes to fitness information products. Most people start a program and 2-3 weeks later move on to the “next greatest thing”. I am proud to say that wasn’t the case with my program. This course is mainly targeted towards guys. Women can get value too, but would most likely want to adjust the phases to insure that they don’t gain too much muscle. Phase I: Quick muscle gains, by focusing in the higher rep range and limiting rest periods in between sets. This creates “cumulative fatigue”…where each set builds upon the previous set. The growth in this phase is largely due to sarcoplasmic hypertrophy. This is an increase in the fluid (sarcoplasm) within the muscle cells. Phase II: “Hardening up” the muscle gained from phase I while continuing to increase muscle mass (but now at a slower rate). We are focusing now in the mid rep range with longer rest periods. Each set is separate from the previous set and now we are maximizing tension and avoiding “cumulative fatigue”. This rep range and rest schedule builds actual muscle fiber (myofibrillar hypertrophy). Phase III: Pure density training for maximum definition while purposely avoiding further muscle growth. You will be doing sets in the 2-4 rep range and rest long enough in between sets to lift heavy weights. There will also be a focus on HIIT to lose any excess body fat. This isn’t a bulk and cut program, but you will simply try to get really lean in this phase. 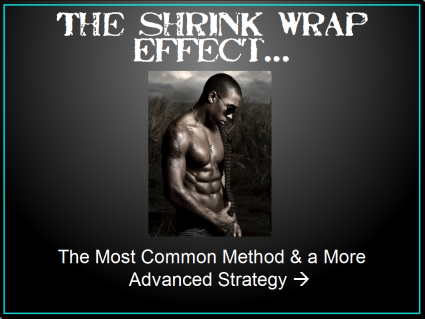 Bonus Phase: This is a strategy used after a period of time in phase III to get what I like to call the “Shrink Wrap Effect”. You begin this phase 3 weeks before an event or vacation. This will make the skin tight around the muscles for maximum definition…and this is long lasting (NOT like carb-depleting and carb-loading). I guess I hate to be seen as a salesperson. 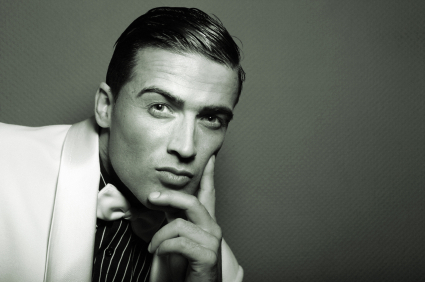 I wanted people to come away knowing at least a little more about getting the lean “Hollywood Look” from visiting my sales page whether they decided to purchase the product or not. If people decide to get the full-blown course, then great…but if they didn’t decide to buy I wanted them to be a little more knowledgeable than before they hit the page. I also tried to keep the page pretty simple and clean like the blog, so this content would be easy to find. …So I will wrap this up. 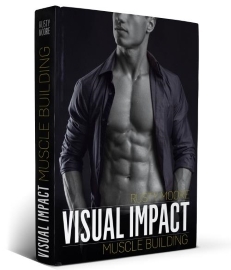 Head on over and watch the 4 videos, because it is valuable content similar to a good blog post: Visual Impact Muscle Building. If you decide to buy then “thanks” and if you just decide to watch the videos, that is cool as well. I am pumped at the response from the Beta testers and believe you will get a lot out of this course if you do decide to invest in it. What is Included? 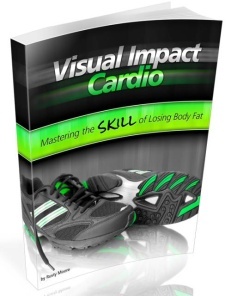 The main “Visual Impact Muscle Building” ebook is 75 pages including a Q & A section from the Beta testers. The “Exercise Demonstrations” ebook is 227 pages with photos. It is extremely well organized with click navigation (pretty darn cool). 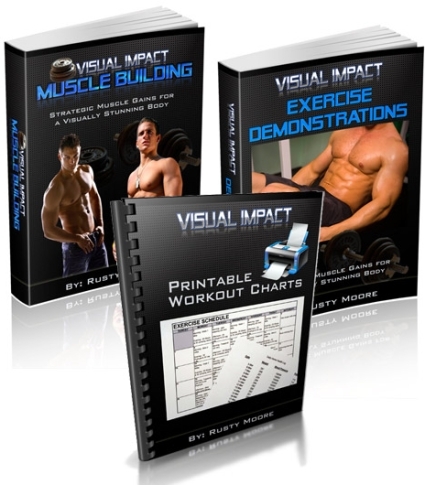 The “Printable Workout Charts” ebook is a printer friendly version of each phase of the workout. It is basic on purpose and designed to save ink and paper. How Much Does This Cost? I priced this at $47. I wanted to keep this around the cost of just one session with a personal trainer. The product is being sold and delivered through Clickbank, so that means that you can pay with any major credit card or Paypal. It also comes with Clickbank’s 60 day guarantee. In phase 3 I replaced two meals with a protein shake. Since I have to keep the calories at a low level in the shrink up phase, can I take the protein shake in combination with creatine? Next post: Resistance Bands – Can Work Chest and Shoulders Better Than Free Weights?